The order of turns was decided by roll of the dice (literally lol). Don't worry, it is fair and balanced, as order of turns REVERSE each round. Last edited by DoomCarrot on Sun May 13, 2018 9:19 pm, edited 9 times in total. Therefore, Midonik may begin by choosing his starting territory! smart move, No where to retreat too, but only one adjacent territory to worry about. Will be updated in T-5 minutes! I choose.... Sacred Mountain! This once sacred place has been defiled by an undead horde, and now it has become a place of death, with no sign of vegetation, or life of any form, except for the few insane adventurers who wander too close to the vile mountain. Last edited by DoomCarrot on Fri Dec 29, 2017 11:32 pm, edited 1 time in total. Yeah,its little risky becouse someone can attack me now and win,but it's best option thought. Midonik, you're going to hate me. I choose 8. Imperfect valley south. Yes, I just picked a fight round 1, with an opponent who can't flee. Elves in the South rise up under the leadership of the Samurai of the Sunrise, intent on crushing the humans of the East. The doom shall not forget the samurai’s plan to undermine the power of the dead. I shall update the map. PiB may choose his starting territory! Merely trying to eliminate the competition. Hey, I could have done it by PM. Also, puss can do the same. Maybe we should darken his color a bit. I didn't​ see his name there, or I'd have included him in the party. Yeah, that was about the closest color to the in-game color I could get, but I could try to darken it a little. EDIT: Next darkest "Cyan" color is more like an ominous sky blue. I will have 4. Imperfect valley. It's a nice spot. The Orcs of the Cave System has decided to fall under the leadership of the States of Warfell, if they succeed making the others on this island to sway under the influence of Warfell. They may join us at another territory and then maybe a state. Round 2 begins! General Brave may take his turn! I send words to the Orcs leaders to march towards the Sacred Mountain. Which held's history and relics of power that the people has long to hold once more. 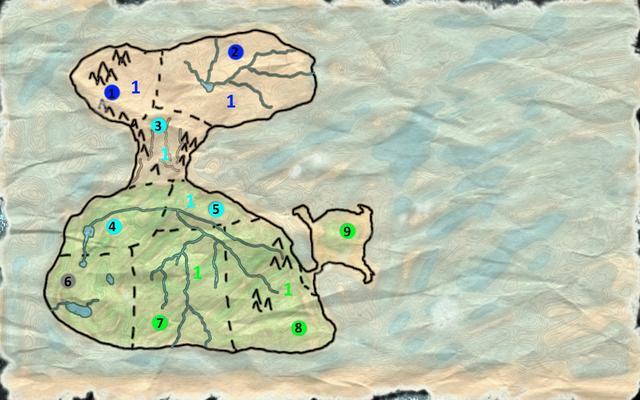 It may be a difficult decision for the Orcs, leaving their homeland undefended. But they must obey or else they may not join the State. Those who wish to attack will be the second to fall. Map has been updated! PiB may take his turn! Don't you dare Puss_in_boots, I will let you live a little longer if you don't attack. I'm gonna hate myself for this, but a leader must do what's best. I choose therefore to launch a take over on the cave system (Once so proudly designed by me). My Nation dearly likes to own territory with terrible terrain. It is to deter attention away. Besides, I knew the territory I selected would prove to be the best position available for an offensive. Then it will be your head and weapon that will be display at the Halls of The Four Point Military Academy. It sounds like you not running away, I might keep you alive for not being a coward. Will update the map in the morning, but Sunrise may take his turn! And it appears there is no where to run to lol. The cave system is a choke point, and if I choose to flee to the frozen plains, then the both of us will essentially be trapped in the North. If I defeat you, then PiB is all that would stand to stop the Doom from sweeping across the desolate North and raising multiple new armies to defend the chokepoint. And I shall defeat you both. You better, or else you'll be lying to me. General Brave wrote: Then it will be your head and weapon that will be display at the Halls of The Four Point Military Academy. Sorry, should have chosen the second territory. I would have been glad to hold the choke point, which the doom gleefully thinks will serve him well. It is a very tight spot there, pretty easy to anticipate your next moves. I already have the plans of attack in my head. Already thought of many ways how you could annoy me, but that would make you vulnerable from the other competitor. So your choice, continue to press on or expand somewhere else. The decision is already made, I must press the attack. Then you must sharpen your bows and arrows. Because you might regret this. We already know my move. Im picking a fight with Midonik, so that I can get that lovely territory with only one entrance all to myself. General, you better win. Doomcarrot has learned how to defeat elves quite​ effectively as undeads, and I doubt puss alone has much chance to beat him. Doomcarrot: your move. Run to the adjacent territory and attack puss next turn (what I'd do in that position), or stay and fight General? I was actually thinking General would choose the other northern territory and force you to fight or run to the middle where you would be more vulnerable. Now you can stay there and just play musical territories. Midonik trapped himself with his choice of territory, and doesn't have a choice in moves now. Midonik: want to go ahead and start our match? Interesting, the AoS campaign seems to have become an expansion game, with only one battle in round 1. The AoF campaign is turning into a barbaric arena in which posturing is cast away in favor of removing the competition as quickly as possible, by whatever means necessary. Soldiers! We lived in this island for ages,but now,those foolish elfs try to take it form us! If we want to survive, we need to fight,there is no other way! There's no retreat! Sharp your weapons,preper you bows,and don't let elfs take our home! Think about lives of your wifes and childrens! It's right think,and God and fortune should favor us! We shall prevail! We will! Carry on Doomcarrot, it's time for ourself to meet in battle.